Specifically designed for wedding celebrations, the Maravilla Gardens in Camarillo is a stand out wedding venue in Southern California. Home to stunning landscaped gardens, rustic features and a distinctly relaxed ambiance, it is ideal for couples wanting a whimsical wedding event. Your guests will be greeted in the fragrant welcome garden, transporting them immediately into this tranquil oasis. Ceremonies at the Maravilla Gardens are held on its adjacent grassy lawns, framed by the plants and trees of the surrounding gardens. Soft drapes provide shade even in the harsh midday sun and diffuse light falls evenly across the setting. Receptions are also held outdoors within what is an undeniably romantic space, and after wining and dining under the stars, you can party into the late night on the dance floor. 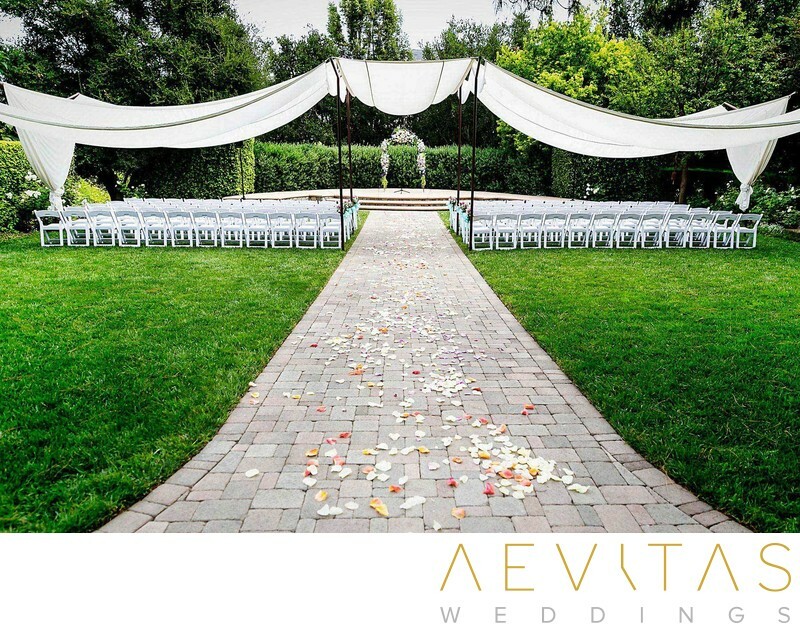 The natural flow of Maravilla Gardens means your guests can easily wander between the ceremony, cocktail hour area and reception space, exploring the gardens on their way. From white picket fences to a rustic old car and whimsical tyre-swings, there a plenty of gorgeous feature elements for captivating couple portraits, all set within the magical grounds of the Maravilla Gardens. With only one wedding held each day, couples have exclusive use of the venue throughout their event. You will have the undivided attention of the Maravilla Gardens staff, and flexible use of the space for your family, friends and your wedding planning team. As a custom designed wedding space, the Maravilla Gardens has a range of on-site rentals, such as photo booths, chandeliers, LOVE signs and vintage furnishings, which you can use to create a truly unique event. With so much at your disposal, couples who choose to hold their wedding at the Maravilla Gardens can let their creativity run wild, knowing that they have the ongoing support of a highly skilled event team helping them every step of the way.